According to etymology, homophone is taken from the Greek word, “homos” meaning “same”. “phone” meaning “voice” or “sound” (Turnball, 2009). So homophones are words that have exactly the same sound (pronunciation) but different meanings and (usually) spelling. Homophone is the words have identical pronunciation but be different words with different meaning (Akmajian, 1995:225). In another sense a homophone is a word that is pronounced the same as another word but differs in meaning (Encyclopedia, 2009). Homophones are words that sound the same but have different meanings and spellings (Rippel, 2010). · Dear /diə/ is referring to loved somebody. · Deer /diə/ is any several types of animal with long legs and a graceful appearance that eat grass, leaves and can run quickly. · Too / tu: / is another way of saying as well. 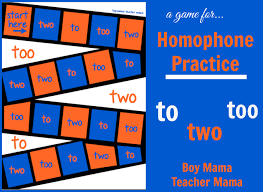 Belum ada tanggapan untuk "Homophone Games in Pronunciation and Speaking"